The world-famous dog show Crufts has beome an annual date on the calendar for Shanklin couple Leon and Donna Sayer – and they’ll be back on the trophy-hunting trail again this year from March 7-10, travelling to Birmingham’s NEC with their prized Yorkshire Terriers, Gucci and Jimmy Choo. For these dog owners, though, canines are more than just a hobby – they’re a complete way of life. When they’re not grooming their own dogs to perfection for a constant round of local, regional and national shows, you’ll usually find Leon and Donna showering loving care on other people’s pooches, at their Shanklin dog grooming salon K9 Cutz. Otherwise, Leon is busy in his role as Vice Chair of the Isle of Wight Canine Association, which involves him in the running of three local shows a year. In fact, sometimes it turns out better! It was a devastating sporting injury that indirectly led Leon to change course, meet Donna – and then, together, to carve out the uniquely dog-centred life that suits them perfectly. Leon had previously worked as a fibreglassing specialist, doing intricate automotive work on luxury car marques including Mercedes and Aston Martin – until a snowboarding accident in 2005 left him with a smashed wrist, and meant he had to be medically retired from his former trade. Then in 2006, he met Donna, a long-time animal-lover who was doing a dog grooming course in Portsmouth. She had already become a regular at Crufts and other dog shows along with her mum Jenny Wood and their Cavalier King Charles Spaniel. Leon had a long-time love of Yorkshire Terriers because his mum and dad had always kept them when he was growing up – so this shared interest in canines was certainly part of what brought him and Donna together. After qualifying as a dog groomer Donna set up in business from home, with Leon helping – and within a year, they opened up their shop. Later that same year – 2007, they married and threw themselves into building the business, studying and gaining further qualifications. Leon qualified after taking a course in Dudley in 2011, and then in 2017 both he and Donna passed their Level 3 City and Guilds in Dog Grooming – both achieving a Distinction. “Yes I suppose we are a bit competitive with each other” he laughed “but we also help each other and it spurs us both on to do well”. After they became a couple, Leon had acquired his own Yorkie, Mr George, who he began showing and then later bred from. 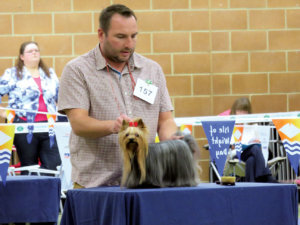 This special little Yorkie was to give them their one big Crufts win in 2015, when he came First in the Veteran Dogs category – having also clocked up many ‘firsts’ at shows all over the country. Sadly, Mr George died last year at the age of 11, but he lives on in his son Radley (named after the well-known handbag brand). Radley also did well on the show circuit and earned himself a lifetime qualification for Crufts. However he had to be retired when he started losing teeth – which in the world of the show ring, is a no-no. Now Leon and Donna have high hopes for their other two “designer named” show Yorkies, Gucci and Jimmy Choo. They’ll travel to Crufts as usual with Donna’s mum, whose Yorkshire Terrier Sasha has a lifetime qualification for the show. “Donna and her mum have done the shows for years and are best mates” says Leon. 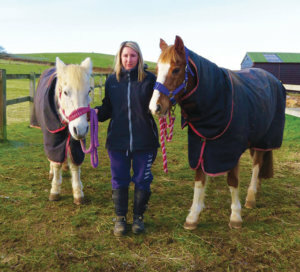 In fact, when the mum and daughter aren’t walking, talking and planning around dogs, they can probably be found mucking out at the stables with their three horses! Back home, Donna and Leon also have their ‘pack’ to look after: as well as their two current show dogs Gucci and Jimmy Choo, there’s also the two retired show dogs, Radley and his mum Bella – plus Bobby, their pet Jack Russell. All of which makes for a pretty hectic way of life – but they wouldn’t have it any other way. And in fact there’s another member of the family who’s gradually getting used to the canine-centred lifestyle – and that’s Leon and Donna’s baby daughter Esme, born last August. “She was our fourth time lucky” says the proud dad, after the couple suffered the pain of two miscarriages and the loss of an early baby. Little Esme is naturally the apple of her parents’ eye and will be accompanying mum and dad to Crufts in March, for her first sight of the show ring. Probably the first of many! Leon jokes that they have other plans for this long-awaited little daughter: “We love skiing and snowboarding so when she’s three we’ll have her on a snowboard – and at five we can start her in the shop!” he laughs.